TSRC13PSCE Nickel Room Temperature Sensor - Edgemont Precision Rebuilders, Inc.
1000 ohm Nickel RTD, linear slide pot for set point adjustment, override push button for occupancy, LCD temperature display and phone jack. 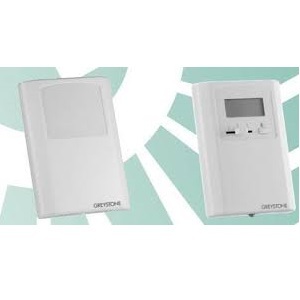 The TSRC Series room temperature sensors incorporate a precision platinum RTD or NTC thermistor in an attractive wall mount enclosure for an efficient monitoring and control system. The universal back plate can be mounted directly to several electrical box styles or directly on any wall. The TSRC has various options available such as set point adjustment, manual override, LCD display, etc that allows for many applications.